Fig. 2-5-1-1 shows the number of released inmates (limited to those who were released from penal institutions on parole or completion of imprisonment term; hereinafter the same in this subsection) and the parole rate (refers to the proportion of parolees among released inmates; hereinafter the same in this subsection) since 1949. The parole rate in 2008 was 48.4% (down 0.5 points from the previous year) for males and 72.4% (down 2.1 points (id.)) 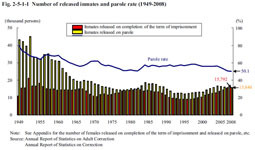 for females (Source: Annual Report of Statistics on Correction).